Adelaide Band 517 started in 2006 playing various events including parties, clubs, weddings, functions corporate gigs. 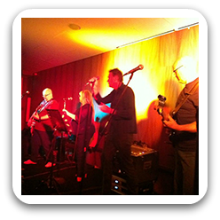 Adelaide Band 517 offers a wide variety in music styles from Kiss to Michael Buble. They supply all production from pro audio PA to pro spec lighting. They use professional backing tracks as well to enhance the musical experience. They have also played many weddings where they provide music that suits the event, and also provide music on an ipod for between sets. Adelaide Band 517 have played many and varying shows since first getting together in 2006 including Weddings, Football Club Functions, Private Shows and Corporate Gigs. We would like to thank the band for providing a night of great Entertainment. We have had amazing feedback from our Clubs as to how much fun they all had. The music was perfect for the crowd. We will definitely be booking them again. Thank you so much to the band members you made our wedding celebrations some thing to remember. Every thing we requested you able to make it happen!! !